Technology truly never fails to amaze us with its newest innovations that we never thought would ever exist or come around in our lifetime. With the continuous improvement of the Internet technology, comes this powerful gadget that allows you to watch your favorite television channels and programs without having to move or even look away from your laptop, wherever you are…whenever you want! Techcom presents the SSD TV 817 or the Techcom USB TV Stick. This is not your ordinary flash drive. This special USB device is a product of the ongoing USB technology evolution that functions as an external TV tuner that transforms your computer into a television, complemented by a full functioning remote control. With this USB TV Stick, you can easily just minimize your active window and tune in to your favorite TV shows. 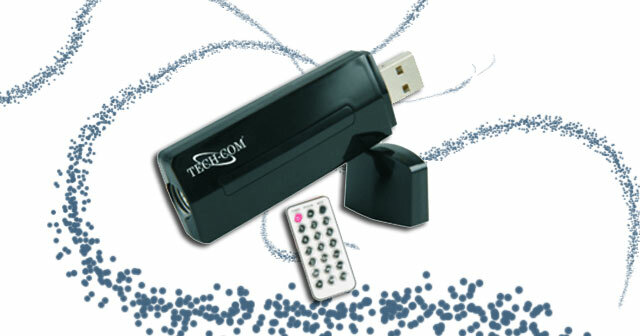 Techcom’s USB TV Stick makes use of the plug and play technology, which means it can be automatically detected and configured by your computer once it’s plugged in. Since it’s powered by the USB 2.0 drive, it does not require any extra power adapter or batteries. It supports online TV reception in all platforms—PAL, NTSC and SECAM, as well as FM stereo receiving. The power of Techcom USB TV Stick doesn’t stop there. Aside from functioning as a television and an FM radio tuner, it also features a video capture function that allows TV recording and taking snapshots. Now, you can save your favorite shows in your hard drive straight away and watch them anytime you want. The package comes with the USB stick, a remote control, a software CD and a quick installation guide. SSD TV 817 is compatible with Windows 7 OS and can be enjoyed at an affordable price of approximately $25. If you’re a frequent traveler, a student, a mobile worker, or simply just always on the go, then Techcom’s USB TV Stick could be perfect for you. No need to miss all your favorite TV shows. Just bring this handy USB device with you anywhere you go, and as long as there’s a computer with a USB port, then you’re good to go! Do you like the idea of a USB television tuner? Feel free to comment below! This entry was posted in Articles, Flash Drive, Techcom, USB Flash Drives, USB Gadgets, USB Stick, USB Technology, Wireless Media Stick, Wireless Media Stick 2.0 and tagged Portable USB TV Stick, SSD TV 817, Techcom Launches Portable USB TV Stick, Techcom USB TV Stick, USB TV Stick, USB TV Tuner Stick. Bookmark the permalink. Is it support Sony Vaio model laptops?